Celebrate the holidays or any special occasion with this stunningly elegant arrangement. This bouquet is created with quality florals and exquisite design and will surely elevate the occasion with it's simplistic beauty. green hydrangeas, green & white kale, white dendrobium orchids, white stargazers with gold accents, created in a gold cube. Florals, accents and vase subject to availability as quantities are limited. 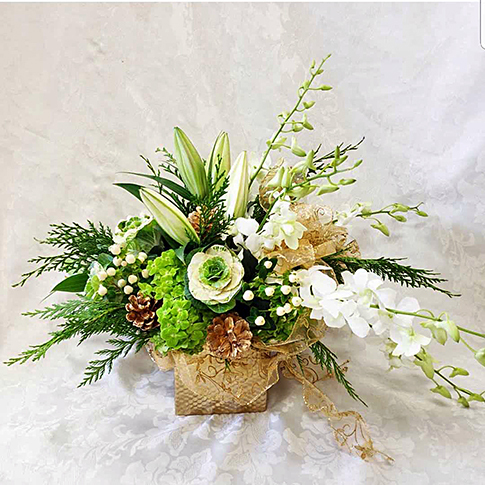 An elegant arrangement deigned in a gold cube, with green hydrangea, green & white kale, white stargazers and white dendrobium orchids, cedar greens, gold pinecones and ribbon.